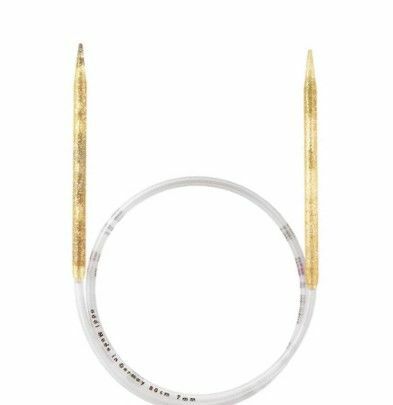 Lightweight, high-quality, champagne plastic with gold glitter circular knitting needles in larger sizes. The largest sizes have hollow white plastic tips with glitter plastic ends. The cords are tubular. Tips for selecting the length of circular needle: when knitting in the round consider the size of the piece that you are making and choose the length of needle that is the same or just shorter than that measurement. You can, of course, knit a flat piece on circular knitting needles, in which case the length is not so crucial!